Good day, my friends. It’s VEGAN FETA CHEESE DAY! 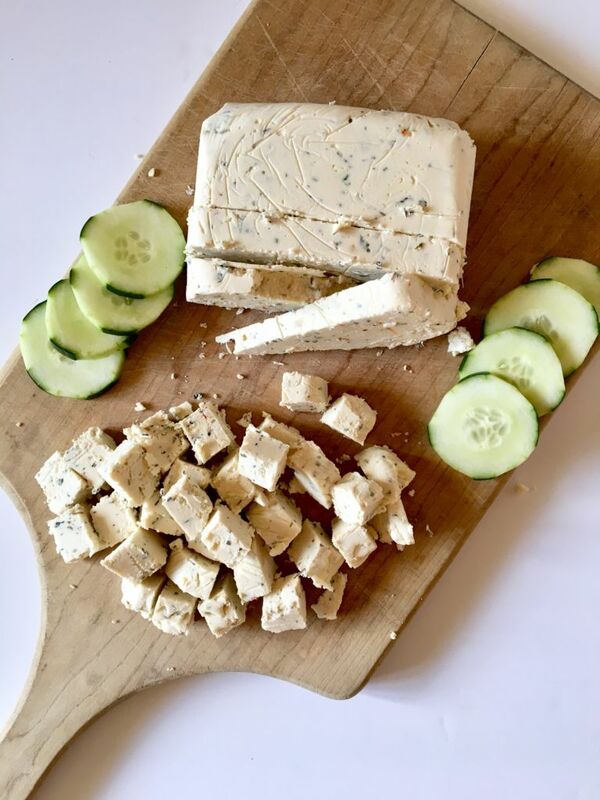 I’m so happy to be here today, SO happy to be sharing this recipe for vegan feta cheese because my, oh, my has my journey to find the best vegan feta felt like a struggle of epic proportions. But today, we have FINALLY cracked the code and are sharing it with all of you! So first off, when I was vegetarian, feta cheese was like a food group to me – could not get enough of the stuff. I put it on everything from salads to pasta to right outta the fridge and into my mouth. And since my cooking know-how was severely limited at this stage, I tended to use that last option more than most. Everything was betta with some feta. Well, you know how the story goes; then I learned about the horror movie that is the dairy industry (like, the WORST), went vegan, and feta and I parted ways for some time. I didn’t necessarily miss it because, like I said, the dairy industry is cruel and soul-crushingly awful and who could ever truly miss participating in that, right? But I was curious to see if I could recreate this crumbly, herb-laden cheese in my own kitchen using ingredients that weren’t taken from our animal friends and especially curious when I could not seem to find a single store-bought vegan feta on the market. And, when I turned to the interwebs for guidance on this, I was pretty disappointed. 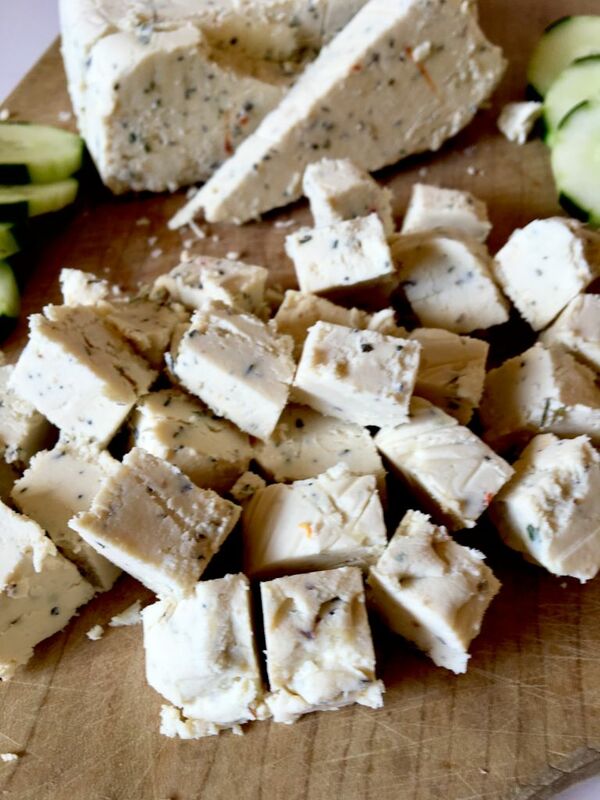 I saw no shortage of vegan feta recipes, but the vast majority of them suggested marinating cubes of tofu in a feta-like brine, and you guys, I just could not get on board with that. Maybe I’m wrong, but the thought of squishy blocks of tofu – even if they were flavored to feta perfection, were NOT going to cut it when it came to my feta needs. I needed something crumbly and hard but not too hard, soft but not squishy, with a flavor that produced the look you see on my face above. I wanted FETA CHEESE, damnit, and I wanted it vegan. So, fast-forward a little bit, after doing more research, I landed on a method suggested by the awesome Skye Michael Conroy. 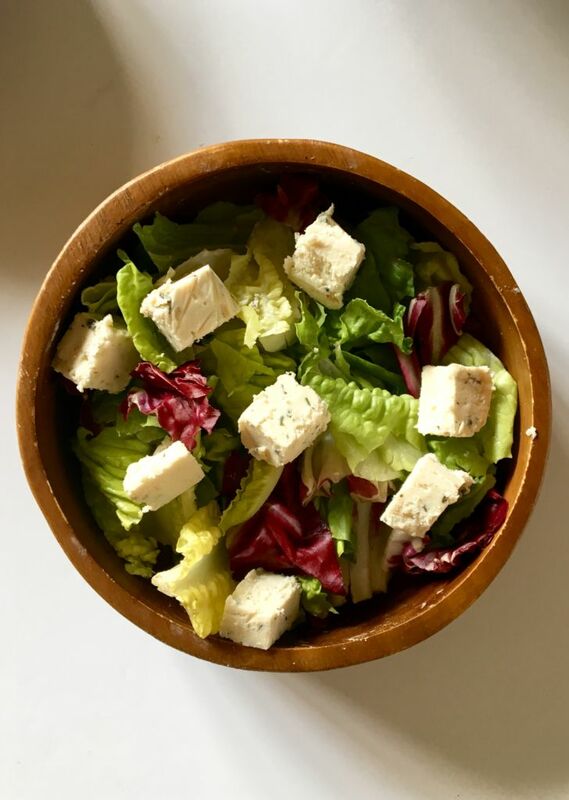 In his book, “The Non-Dairy Evolution”, he shares a method for making vegan feta that I knew was going to be perfect, using a base of extra-firm tofu and refined coconut oil, blended and chilled. Yes! This was the method for which I had been searching – no squishy cubes of tofu, no weird flavorless almond paste that falls apart when you try to slice it (yeah, that happened 😭). This was feta perfection. 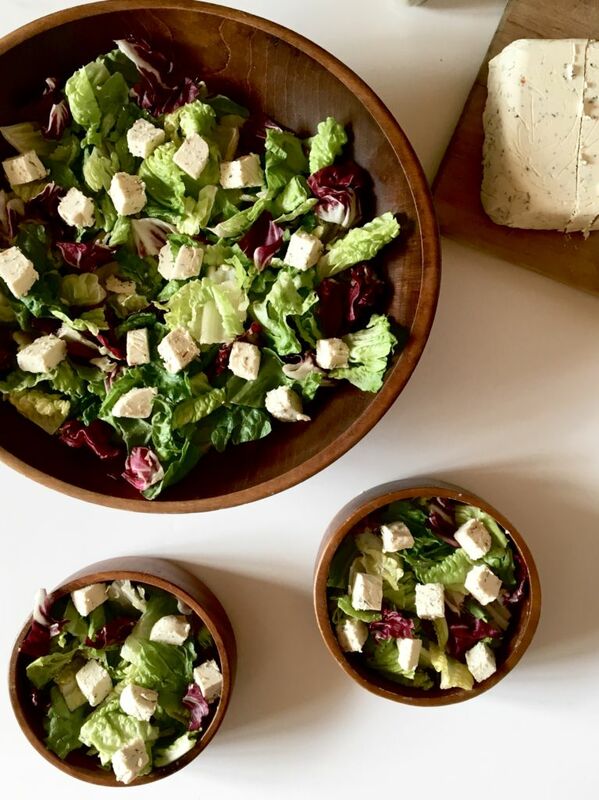 I took his method and changed a few things here and there – added some ingredients, took some away, changed measurements – until I found the perfect feta for me. And you guys, it is. It SO is. I love this vegan feta recipe so freakin’ much, I could cry right now. 😍😭That’s not an exaggeration; I get super emotional when I create a recipe like this. It’s everything I ever wanted, the culmination of a journey spanning over four years, how could I not cry?! We even had a vegetarian friend of ours test the stuff (because, you know, it’s starting to become a while since I’ve had the dairy stuff), and she loved it too! Score!! So, how do you make this vegan feta cheese? It’s so much easier than you could ever imagine. Basically, if you can use a blender, you can make this vegan feta cheese. You will need to let the cheese set and firm up in the fridge for about 8 hours though, so be sure to give yourself some time. But when it comes to the actual work you have to do, it’s incredibly minimal. Drain your tofu, blend your ingredients, pour into a mold (anything you store leftovers in will do), and set it in the fridge to chill. Yes, it IS that easy. We used this Vitamix for this recipe. 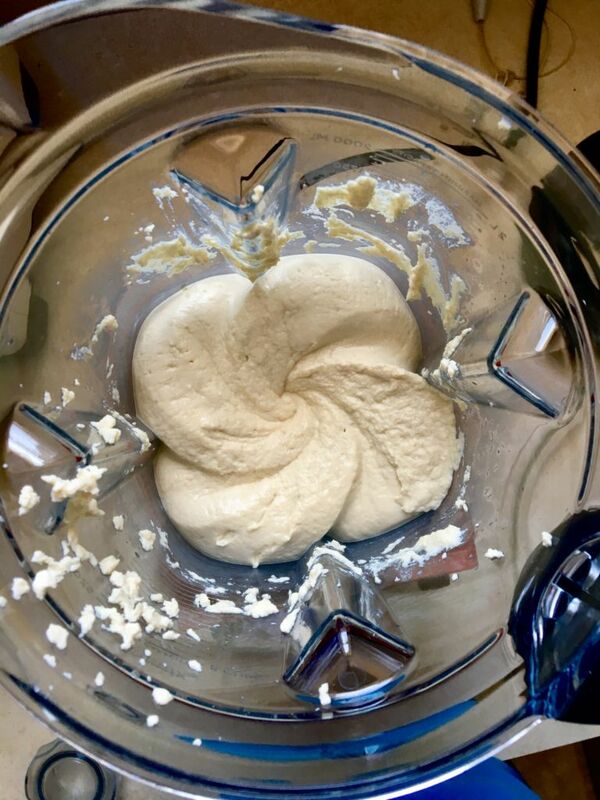 It has a deeper bowl than our other Vitamix and works great for this vegan feta cheese recipe, but you can use any food processor you have! And voila! You’ll have a beautiful block of vegan feta cheese that you can slice, cube, toss into salads and pasta dishes, top your falafel pitas, and even eat right outta the fridge (which may be the most common way I’ve eaten this over the past few weeks if I’m being honest 😂). Your non-vegan friends and fam will LOVE it, and your life will be filled with feta deliciousness from now until eternity. All that, and no mama / baby cows were harmed. The most awesome vegan feta that is slice-able, crumbly, and full of that unmistakable feta flava'! First, make sure your tofu is completely drained. We drain it on paper towels until they're no longer soaking up water. A tofu press works too! 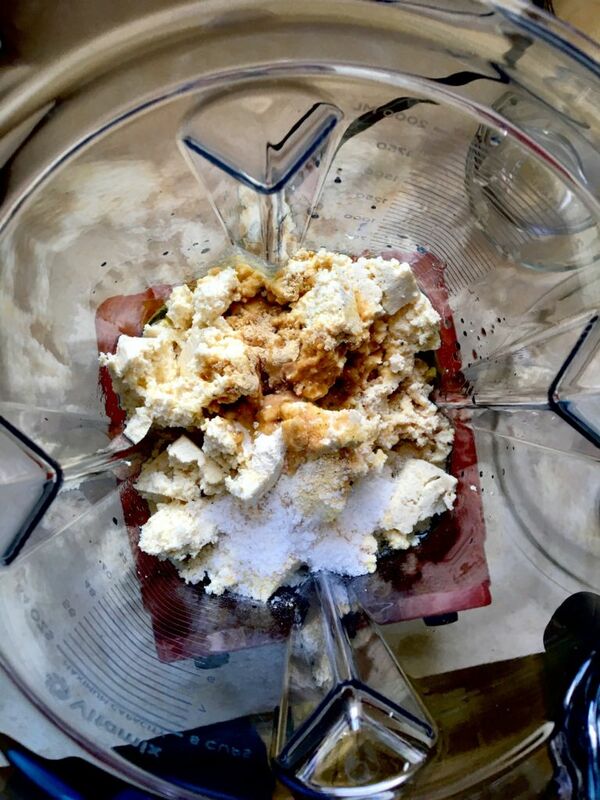 Next, crumble your tofu into a food processor and add all the ingredients (except the Italian seasoning) and blend until smooth and creamy. This will take a few minutes, as you want the oil to emulsify a bit. You may need to stop and scrape the sides of your processor a few times.Then, stir in your Italian seasoning. Grab your mold (we used a Pyrex-type container, anything you wrap leftovers in will do) and line it with plastic wrap. This will help you lift your cheese from the mold when it firms. Pour the cheese mixture into the plastic-lined container and use a rubber spatula to smooth the top as best you can. Then, cover it and refrigerate for at least eight hours. When the time has come, use the plastic wrap to lift the cheese out of its mold, and enjoy! Slice it into cubes, throw it on salads, falafel, or eat it right outta the fridge! Store this vegan feta cheese in an air-tight container in the fridge or freezer. The cheese will soften significantly the longer it's out. This recipe was adapted from Skye Michael Conroy's book The Non-Dairy Evolution . If this stuff interests you, definitely check that book out. Your life will change! Hi. Just made this and I'm very excited to taste the result! Do you think it would freeze well? It makes a lot (for me) and I'd like to divide it up if possible. Thanks for the recipe! Hi, Sherry! Yay!! We're so excited for you to try it! Yes, this freezes really well. In fact, I have been cubing mine and storing it in the freezer for salads because I find it stays a little firmer that way under all the dressing and veggies. Enjoy! Hi Brittany, Thank you for your response. I made the cheese yesterday and it was firm enough for me to try today. OMG! It tastes just like the feta I remember when I wasn't vegan. Delicious!!! Funny I was thinking it might be a good idea to freeze it because the coconut oil does warm rather quickly. I'm going to prep it just like you and have it handy at all times. Thanks again for an amazing recipe!! And I forgot to rate it so here ya go! Hi, I want to make this cheese, however; I do not eat any soy because of the the health risks I've been reading about it. What can I substitute? Thanks! This sounds wonderful and I want to try it but was wondering if I could substitute a different oil for the coconut oil. Would it still firm up? Hey, Lesley! Hmmm, the coconut oil is what makes this feta firm and slice-able, so I'm not sure how to replace it. This has NOT been tested, but it may be worth a try to add some extra olive oil and freeze this rather than letting it set in the fridge? Worst case scenario, it might get you a feta-flavored spread for toasts! Hi, Indira! That TOTALLY makes sense, and I hope you love this recipe as much as we do! 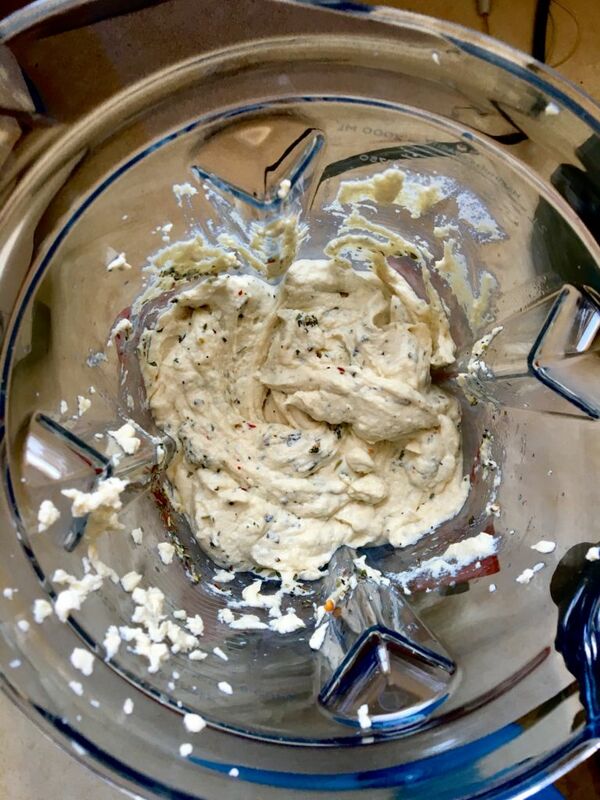 :) This recipe does not need to be marinated like other vegan fetas, as you're blending all the ingredients together in a food processor. You can store it in a sealed container in the fridge for a week or so, or you can store it in the freezer for up to a month. I would think you could substitute a vegan shortening like Spectrum, which is made with 100% palm oil, and is rainforest certified as well. I could see that working well. Thanks for the tip, Lisa! I tried this with extra firm, organic silken tofu and it did not firm up at all. And it was incredibly salty. Too salty to use as a healthy spread. I will try it again with regular, firm tofu, but I will cut out the 2 tsp of salt. The olive brine was probably plenty salty. Hey, Molly! You definitely want to use extra firm regular tofu, as silken has a completely different texture and absorbs flavor differently (hence it tasting too salty). Also, it's super important to remember to check the package of tofu and make sure you are using a full 16 oz of tofu. I don't know if this is the case for you, but a lot of silken tofu is sold in a smaller weight which would also greatly intensify the saltiness. Hi Brittany..I was wondering how your feta would taste without the Italian herbs. I was thinking about when it would be used with dishes needing a plain seasoned feta or not specifically Italian. Your recipe will be my first attempt at a vegan feta and I am so excited to try it! I promise to rate it after trying it! Hi, Debi! Apologies for getting back to you so late with an answer on this, but I think you could definitely get away with making the feta without the Italian herbs! Hi, Erin! 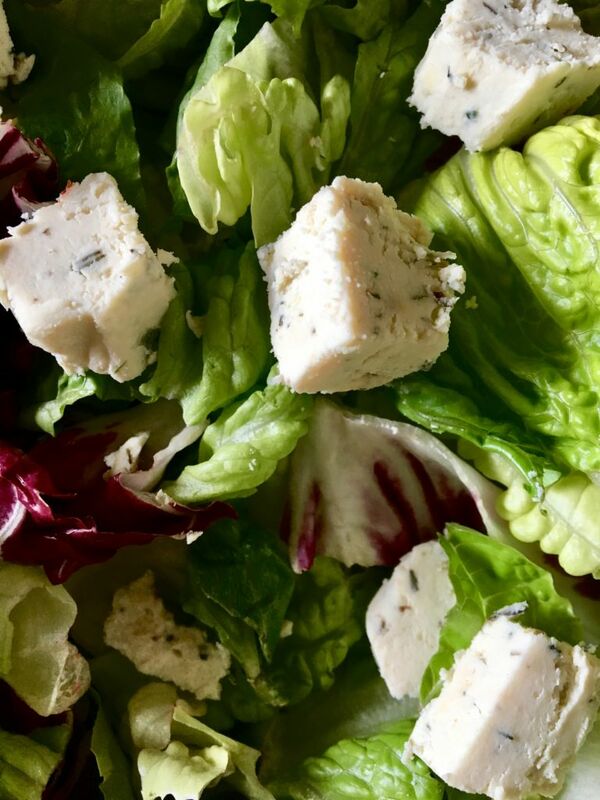 I'm guessing you already had your party, but a little trick we have done is cube the feta, freeze it, and then add it to our salad right before we leave for the party. That way, it's the perfect texture when you arrive! I am so, so happy to hear you're enjoying the feta so much!! This recipe is outstanding! The feta just keeps getting better each day. Great tip to cube and freeze for another day. Thank you. Okay - this recipe is AMAZING! I have told everyone about it. I am shocked at how much this tastes like feta and how versatile it is - from pasta to salad to bruschetta and pizza toppings! I am in love. Thank you, thank you, thank you! You are so very welcome, Emily! So excited to hear how much you love it! Hi love the idea of this recipe but I don't have rice wine vinegar, would red wine vinegar or apple cider vinegar work well in its place? I also grew up living off feta as a food group till I went vegan. so I look forward to trying out your recipe ! Hi, Nicole! Some white vinegar or apple cider vinegar should work just fine. Ahhh, I'm so excited for you to try it; let me know how it goes! Tried the feta, delicious flavour but did not firm up more than cream cheese texture, even using well pressed tofu. Makes a great "cheese ball" however, rolled in nuts or dried parsley so will use that way. Will try again with half the amount of coconut oil and see if firmer results. Hi, Tilly! A few trouble-shooting tips for you: The coconut oil is actually what helps the cheese firm up, so if anything, I'd recommend upping the amount rather than halving it. We find it's super easy to change the texture if you add even a little less coconut oil than the recipe calls for. We also find it super helpful to freeze the feta, cube it, and freeze the cubes for quick and easy use in salads and such. It helps keep the cheese more firm when you're mixing it with dressing and all that yumminess. Hope this helps!